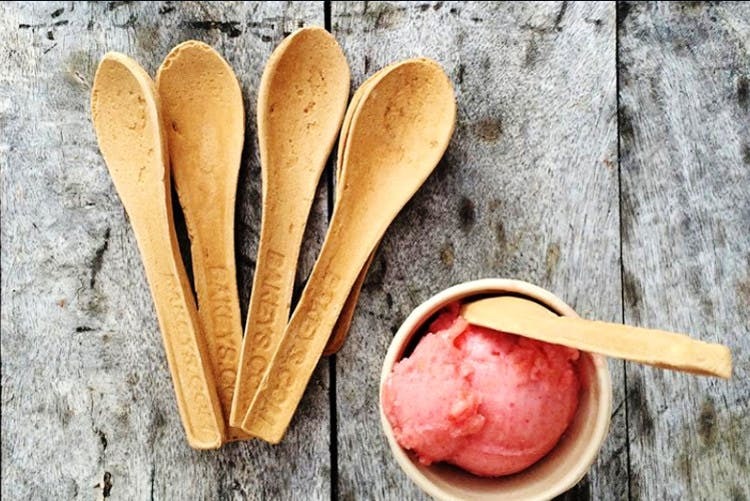 Who knew that you don't have to throw away or wash your spoons after you eat with them? Yes, Bakey's lets you eat up your spoons as well. Bakey's was founded by former Hyderabadi researcher — Narayana Peesapaty, in 2010. It is bringing about a revolution in the way we eat and also in the eco-system, ever since. Troubled by the reuse and harmful effects of plastic? Turn to Bakey's and be an instrument of change. The tableware here is baked out of millets, for the most part. But, you can also find different flavours like sugar, ginger cinnamon, mint ginger, ginger garlic, cumin, celery and black pepper in the edible cutlery. Made out of 100% natural products that are vegan, you will not only lead a hygienic lifestyle but also relish its taste. They will be widening the product range by making forks, small bowls, plates, salad bowls, and soup/yoghurt/dessert spoons soon. They ship worldwide and you can place orders on their website starting at INR 375 for a set of 100 plain spoons. All their products are solid enough not to dissolve in your food, but also soft enough to nibble on. They stay for upto 24 months if not taken out of the wrapper, and are for a single time use only. So, buy them today and be a part of the cause.